This is a great idea, but it's kind of been done before, Apple. Already ticket retailers are issuing QR barcodes via SMS, to be scanned when entering gigs—though Apple does show nifty iTunes integration in its patent. 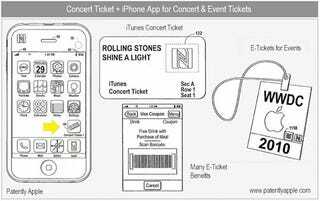 The patent was dug up by Patently Apple, and is called the Concert Ticket+ system, which would see gig tickets sold through iTunes, with the ticket stored on an iPhone, for presenting at the door of the venue. Maps, venue information and seating plans would all be incorporated into the app, just like iConcertCal already offers. It'd definitely cut down on paper waste—not to mention labour at ticket retail companies—but is there enough space in the market for another ticket retailer, alongside Ticketmaster and everyone else? Unless Apple will be collating other retailers' tickets into iTunes—taking a slice of profit for themselves, naturally.